This book describes the context and role of accounting in business. Some theoretical frameworks are provided. It is hoped that this will provide a foudation for reader's understanding that accounting is more than a technical subject but is grounded in competing theories. 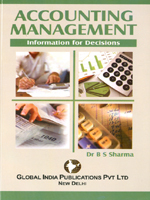 The book shows the readers how accounting information is used in decision-making, planning and contol. The accounting tools and techniques are explained. Theory is integrated with the tools and techniques which students will find very useful in understanding the subject.